Fresh off their 30th anniversary celebrations, the team at Great Lakes Brewery is launching a new line-up of beers: the 7 Barrel Series. The story behind this new series of beers is really fun! 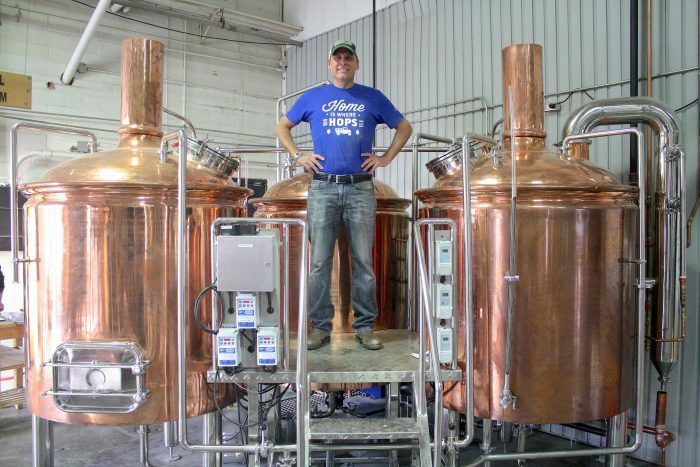 Last year, Peter Bulut, Owner and President of Great Lakes Brewery, got the team at GLB a 30th birthday present: a shiny new copper pilot system. The system, consisting of a mash/lauter tun, hot liquor tank, and kettle sitting upon on a small raised platform, would be able to produce up to 700 litres (or 7 barrels) per batch. Hint: that might be where the name comes from. Throughout the last year, they created a ton of great beers using the system. There were beers made by beer writers; beers made by bar and restaurant staff; beers brewed by other breweries and beers brewed by community associations like Newstalk 1010, ACTRA (Alliance of Canadian Cinema, Television and Radio Artists), Two Islands Weekend, and Toronto Rotary Ribfest, to name a few. It was a busy little system. The 7 Barrel Series is a way of continuing this momentum, while providing an avenue to showcase the work from their new artist, Patrick Corrigan. They’ll be bringing back some old favorites in bigger batches. Favorites like Meanwhile…Down in Moxee, Grimace�s Tears, Found Money, What Willis Was Talking About, The Puzzled Huntsman, Grandpa�s Ol� White Eggnog Stout, plus so many more. It means more unique, collaborative craft beers at Great Lakes Brewery. It means more one-offs, more experiments, more cool beers you can’t find anywhere by the GLB bottle shop. One more reason to visit them at the brewery soon! For more information on Great Lakes Brewery and the 7 Barrel Series, check out their website. For more information on brewing and brewers in Ontario, visit the Ontario Craft Brewers.